Deadline to enter is December 10, 2018. Photos can either be taken by you or of you, while overseas as a Saint Mary’s student engaged in international learning activities. Don’t know which photo to choose? You can submit up to three in each category. If you decide to participate in both categories, that’s a total of six photos. Fourteen winning photos will be included in the 2019 Study Abroad Photo Calendar, which will be proudly displayed across campus. Winners will receive a free copy of the completed calendar. Send an email to international.programs@smu.ca with your entry details before December 10 December 14, 2018. Include your photo(s) as a file attachment. By submitting your photos, you offer your consent to have them used in promotion of Saint Mary’s University global learning programs, both in print and online. A few sentences that explain the context of each photo and why it is meaningful to you. Are you a student who has been on an international program? We are waiting to receive your entries! 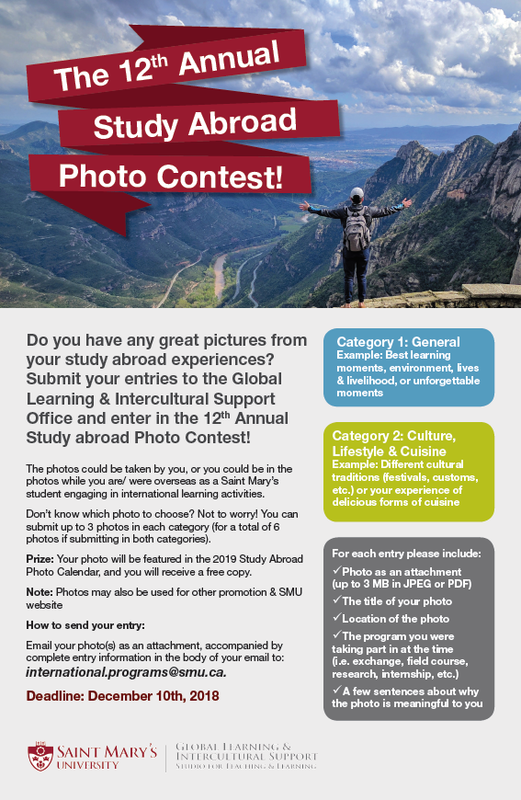 If you know of a SMU student who got great pictures from their overseas experience, please encourage them to enter the contest. We are also happy to receive entries from faculty and staff members who were group leaders in international field programs, or those who were teaching abroad within the last year.